Often in the history of evolutionary theory, early preliminary reports of new fossil finds are over-optimistic. Until recently, the pongid (ape-like) characters of the renowned fossil find, Skull KNM–ER 1470 from East Rudolph, Africa, have been ignored and the supposed human features have been emphasized. The early enthusiasm generated by this find of an apparently human-like creature has now been somewhat dissipated by the use of bone-scanning techniques not available to the original researchers in 1972. Skull 1470 now appears to be that of an australopithecine with a larger brain size. In late 1972, an enigmatic fossilized skull was unearthed near Lake Turkana, Kenya. The skull, which was subsequently accessioned by the Kenya National Museum as East Rudolf specimen 1470 (or KNM–ER 1470 in abbreviated form), was unearthed by Bernard Ngeneo—a field worker for renowned paleoanthropologist, Richard E. Leakey. The discovery was greeted with much enthusiasm by evolutionists the world over because it appeared to bridge the gap between the putative hominid line of ancestors (including the australopithecines and Homo habilis) and the decidedly more humanlike fossils designated Homo erectus. However, it was not long before other experts began to express doubts about the evolutionary significance of Skull 1470. In the course of time, the pendulum began to gradually swing the other way as various students started to doubt the accuracy of the original reconstruction. Figure 1. The remarkably flat face in the original reconstruction of Skull KNM–ER 1470 from East Rudolph, Africa. 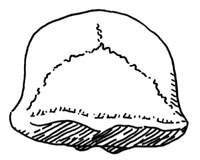 Note the diminished supraorbital torus (brow ridge) as compared with later reconstructions (from Wood). Its alleged large endocranial volume (ECV) of 810+ cm3. The remarkably flat face of the specimen as compared with the prognathous (protruding jaw) face of all other known australopithecines, especially the gracile, and to a lesser extent, robust specimens. The high-domed cranial vault, as compared with the flat forehead of extinct australopithecines and modern-day apes. The lack of pronounced supraorbital tori (brow ridges). The more rounded braincase, similar to that of some Australopithecus africanus specimens. Anyone viewing the lateral profile of 1470, as it was first presented, could not help but marvel at its apparently modern aspect (Figure 1). Yet doubts arose because these ‘modern-looking’ features clashed with the supposed linear progression of the ape-like prognathicity of the australopithecines to the various known examples (at that time) of Homo erectus skulls which still, to a lesser degree, retained this feature. In other words, the established pre-1972 hominid lineage did not allow for a flat-faced, small-browed form before the appearance of Homo erectus. The radiometric date for 1470 was eventually accepted as about 1.9 Ma, whereas erectus forms with more ‘primitive’ characteristics were (at that time) only known from later times (700 ka in Asian regions, and 1.6 Ma in Africa). In recent times, redating of some of the Java specimens of H. erectus have produced considerably earlier (older) ages. Gracile australopithecines were known from over 2 Ma, while robust forms persisted to about 1 Ma. This puzzle was, I believe, the reason skepticism began to arise in evolutionary ranks, which eventually led to questions about the skull’s original reconstruction. Figure 2. 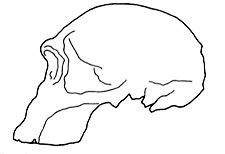 Typical of australopithecines is the occipital flaring visible in the posterior view of Skull 1470 (from Howells). Homo erectus specimens known at the time did indeed exhibit several traits observed in australopithecines, whereas 1470 did not, except for its larger ECV as compared with other gracile forms. Clearly, 1470 did not fully fit the inferred intermediate status in all-important characters. the ape-type cranio-facial index of 59.0, which places it well within the australopithecine range of 51.0–64.5 (the human range is 30.0 to 45.0). This was significant in view of what was to come later. Figure 3. A more up-to-date lateral view of 1470 by Pellegrino. Brow ridges are clearly evident, and the face is more prognathous (from Pellegrino). 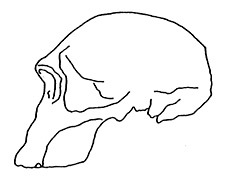 A more up-to-date reconstruction of 1470 appeared in Pellegrino’s 1985 work.7 Now the skull had a flatter forehead, noticeable supraorbital tori, and a more prognathous face. Also evident was postorbital constriction, plus the dolichocephalic (long and narrow) nature of the brain case. The similarities to the australopithecines were becoming more obvious (Figure 3). In 1985, the primatologist Napier, reproduced a more up-to-date anterolateral photograph of 1470, which clearly indicated a more robust specimen, especially in the forward jutting of the face.8 Napier ascribed an ECV of 750 cm3 to the skull. In 1995, Howells pointed out that some experts, such as Wood, were no longer consigning 1470 to the taxon Homo habilis but rather to a separate species, Homo rudolfensis.9 Wood had elucidated this view in 1993.10 In 1995, Leakey himself produced another reconstruction of the skull, which was quite similar to that of Pellegrino.11 This time he consigned 1470 to the taxon Homo habilis (Figure 4). Figure 4. In this 1995 reconstruction, the discoverer himself has apparently acknowledged that the original reconstruction was not accurate (from Leakey). They were able to discern the cells responsible for deposition and resorption by the telltale traces on the surface of the bones involved. Bromage and his colleague Dennis Smith of Toronto then developed an analysis, which avoided the necessity of damaging the valuable skull material itself. Theoretically, a study of the surfaces of such bones in a hominid face would reveal the pattern of deposition and resorption. In practice, it proved a little more difficult. However, using a new technique the team was able to ‘read the messages’ left by the surface traces. Figure 5. This may be the true profile of 1470. Based on new bone-scanning techniques, typical australopithecine prognathicity is evident in this 1992 drawing (from Bromage). Bromage and Dean soon found other evidence pointing in the same direction. By studying growth lines in tooth enamel in other fossil hominids, they found the teeth of many early specimens developed at ape-like rates. This was confirmed later by a second team (Conroy and Vannier).14 The results came as quite a shock, and ran contrary to prevailing views on hominid maturation. Few, if any, hominid students would consider that WT 17000 is on the human line. The fossil has a chimp-sized brain, no forehead, a massively prognathous face, a massive sagittal crest and extreme post-orbital constriction and its meatus angle (pitch of face onto the cranium) is in the range of chimpanzees and A. afarensis! Compared with WT 17000, Skull 1470 does indeed possess a large braincase: ECV of c. 752 cm3 vs <400 cm3. When WT 17000 was discovered in the mid-1980s, it caused consternation because it seemed to be inferring that was going backwards. WT 17000, dated at 2.5 Ma, is more robust than the much earlier A. afarensis specimens, which date from approximately 3.3 Ma. According to Bromage, WT 17000 shares one or two features with so-called early Homo, as do some other A. boisei forms, but it is most unlikely that ‘early Homo’ is a genuine human-like type. Without elaborating on these supposed resemblances (except for the long and protruding upper jaw), Bromage says that there is a provocative resemblance to WT 17000. This is difficult to seriously accept, but any similarities between boisei and Homo create problems for the evolutionist because two such disparate forms would have had to acquire these similar traits independently in both lines. The only other alternative, is to speculate that the early ‘Homo’ and A. boisei forms gained these likenesses from some unknown common ancestor. The creationist view (the correct view in my opinion) is that so-called early Homo is not Homo at all and is nothing more than a larger-brained australopithecine. There is no compelling evidence to contradict the common creationist view that A. boisei, the hyper-robust boisei (WT 17000), and Paranthropus robustus, all belong to one created kind, with all so-called gracile types (ER 1470, the Taung ‘child’ and other africanus) possibly making up another. Most afarensis specimens share affinities with the gracile forms (africanus). The opinion that all australopithecine forms, whether or not one chooses to call some of them Paranthropus, belong to just one genus is not uncommon, even in the evolutionary camp. The latest reconstructions of Taung and ER 1470 by Bromage and his team indicate that these two forms are strikingly similar to other australopithecines, and very different from known Homo types such as erectus.17. Also in both specimens, the meatus angle is in the chimp/africanus range, and not in the known human range. This is without question a clear structural separation between the erectus human specimens ER 3733 and ER 3883 on the one hand, and other so-called hominid forms, such as the ‘habilines’ ER 1813, ER 1470, and several boisei and africanus specimens, plus the common chimp on the other. Of course, similarities can be misleading. Bromage claimed that modern humans and afarensis share the way in which their cheekbones are swept back relative to the upper jaw, a point which could indicate that afarensis may have been ancestral to man. But instead of finding that the bones of both the two species developed in an identical way, the opposite was true—‘Although the two faces [afarensis and humans] share some similarities, they [were] built in very different ways during development,’ says Bromage. ‘This particular characteristic cannot be used in support of an ancestral relationship between A. afarensis and humankind,’ he said17 (emphasis added). Bromage does not totally reject Skull 1470 as possibly belonging to the genus Homo, but this opinion seems to be mostly based on the larger size of the skull in comparison with other australopithecines. Yet, it is also possible that the latest estimates of 752 cm3 may still be too large for Skull 1470, in view of its now completely ape-like skull morphology and its long forward-jutting jaws and non-existent forehead. Bromage believes that the real, common, ancestor of humans and australopithecines may be found in a form, which was already evolving in both Homo and Paranthropus (A. boisei), and that the best candidates may be the hyper-robust WT 17000 and the gracile A. africanus. I believe most of these contradictory problems are caused by paleoanthropologists insisting on calling all the australopithecines ‘hominids,’ rather than hominoids. Although overall ape and human brain structure is somewhat similar, there are a two areas, which may help to distinguish between fossil apes and humans—the two major language centres (the Broca’s area and Wernicke’s area) and the lunate sulcus, which is found in humans but not in apes. These features sometimes leave faint traces inside the skull, and claims have been made that a Broca’s area is discernible in Skull 1470. However, as Leakey says,20 the issue is by no means clear, and the experts are divided. The material is extremely difficult to interpret because the markings on the brain casts are very faint. Like humans, chimps and gorillas are vocal, using lips, tongue, and vocal cords when communicating, and they too have a Broca’s area.21 However, it is the smaller, less detectable Wernicke’s area, which is necessary for full speech. A Broca’s area exists in the erectus specimen WT 15000,22 but has not been detected in any other H. erectus specimen as geologically old as the Turkana Boy. This aspect must, therefore, be left in the ‘extremely doubtful’ category. Certainly no evidence exists for the presence of the lunate sulcus or Wernicke’s area in ER 1470. Figure 6. Comparative lateral profiles of the ‘Taung Child,’ (a specimen of A. africanus), and a juvenile chimpanzee. The similarities are clear. By the time the chimp has reached adulthood the resemblances are much less obvious (from Beasley). Before concluding, the work of creationist hominid researcher Beasley must be considered.24 In his recent creation theory of pre-Flood giantism and post-Flood dimunition, declining longevity and earlier skeletal maturation (morphological shrinkage), he presents compelling evidence to show that the australopithecine apes and the so-called ‘habilines’ have nothing to do with human origins. The evolutionary view is that man’s ancient ape-like ancestors (the australopithecines) were generally much smaller human-like creatures, which gradually developed into larger man-like forms with constantly-increasing brain capacity. This is totally opposed by Beasley’s evidence. His theory proposes that so-called habilines, including Skull 1470, plus various species of gracile australopithecines, may be the migratory, non-evolutionary ancestors of today’s pygmy and common chimpanzees. The coarse, robust australopithecine forms such as A. boisei and WT 17000 could well be ancestral to modern common chimps and/or gorillas. Skull 1470 is completely rejected as belonging to the genus Homo, and in fact Beasley considers that the habiline and africanus specimens are probably congeneric, if not conspecific. The text and Figure 13 of his 1990 work, strongly suggests a lineage leading from ER 1470 through ER 1813 and the africanus Sts 5 (Sterkfontein South-East African specimen 5) to today’s Pan paniscus (bonobo).26 His theory is based on changes in mean cranial capacities and craniofacial structure during a postulated migration through Africa from Asia Minor. Comparative lateral skull profiles of the Taung ‘Child’ and juvenile chimps bear an uncanny likeness to each other, while the latest profiles of East Turkana habilines such as ER 1470 and KNM–ER 1813 appear to reflect an increasing simian appearance, accompanied by morphological shrinkage.26 Comparisons of KNM–ER 1813 and the skull of a pygmy chimpanzee are instructive.27 These interpretations are compatible with the remarkable lack of chimp and gorilla forms in the fossil record. It strongly supports Pliocene and Pleistocene australopithecines being ancestral not to humans but to modern African pongids. Strong nuchal cresting28 is present in ER 1470, ER1805, and to a lesser extent in ER 1813. It is interesting to note that the development of saggital crests in living chimpanzees is not altogether common, and is generally restricted to males of the species. Indeed, saggital crests are not particularly diagnostic, since they can be found in some Inuit (Eskimo) males. What is clear is that the later reconstructions of skull 1470, along with Bromage’s bone-scanning technique, reveal a craniofacial structure similar to gracile australopithecine, except for the larger brain size. The old flat, human-type face is gone, the forehead has disappeared, the marked supraorbital ridges are firmly established, and the facial prognathicity is obviously in line with all other australopithecines. Along with Skull 1470, another intriguing puzzle seems to have been solved—the alleged habiline ER 1813 is also now seen to belong not to Homo, but to the genus Australopithecus. Until recently, Skull 1470’s supposed human-like traits were constantly being emphasized while its pongid characters were simply largely ignored—now the latter can no longer be neglected. One must be careful not to claim this is necessarily the end of the 1470 saga—more developments may yet occur, but we can only go on the state of knowledge at any given time. 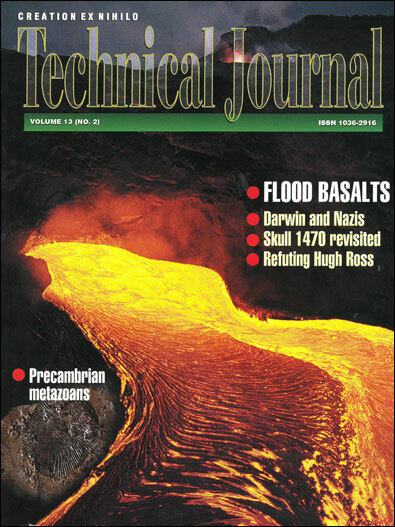 Twenty-five years ago, it appeared that 1470 fitted the evolutionary scenario reasonably well. In 1999, it looks increasingly like a larger-brained gracile australopithecine. There is precious little evidence to show otherwise. For the present it should be quietly packed away and added to the long list of abandoned or downgraded hominid specimens, which once adorned our natural history textbooks. Update: For another, more recent, view on this fossil, see Fossil evidence for alleged apemen—Part 1: the genus Homo. A.W. (Bill) Mehlert (now deceased) at the time of writing had a Diploma in Theology and lives in Brisbane, Australia. He was a keen student of flood geology and the fossil record, including the supposed fossil evidence for human evolution, and had written a number of important articles on these topics in the Creation Research Society Quarterly and the Journal of Creation. Return to top. Wood, B., The Evolution of Early Man, Cassells, Australia, Sydney, pp. 75, 78, 1976. Return to text. Johnson, J.W., The Crumbling Theory of Evolution, Perpetual Eucharistic Adoration Inc., Los Angeles, pp. 45–52, 1982. Return to text. Pellegrino, C.R., Timegate: Hurtling Backward Through History, TAB Books, Blue Ridge Summit, Virginia, p. 120, 1985. Return to text. Hummer, C., A plea for caution about Skull 1470, CRSQ 14:168–172, 1977. Return to text. Howells, W., Getting Here: The Story of Human Evolution, The Compass Press, Washington DC, p. 89, 1993. Return to text. Lewin, R., Bones of Contention, Penguin, London, pp. 160–161, 1987. Return to text. Pellegrino, Ref. 3, p. 134. Return to text. Napier, J.R. and P.H., The Natural History of the Primates, Cambridge University Press, Cambridge, United Kingdom, p. 181, 1985. Return to text. Howells, Ref. 5, p. 89. Return to text. Wood, B., Rift on the record, Nature 365:789, 1993. Return to text. Leakey, R., The Origin of Humankind, Weidenfeld and Nicolson, London, p. 28, 1995. Return to text. Bromage, T., Faces from the past, New Scientist 133(1803):32–35, 1992. Return to text. Bromage, Ref. 12, p. 32. Return to text. Conroy, G.C., and Vannier, M.W., Dental development of the Taung skull for computerized tomography, Nature 329:625–627, 1987. Return to text. Bromage, Ref. 12, pp. 33, 35. Return to text. Leakey, M.G., and Leakey, R.E., Koobi Fora Research Project 1: The fossil hominids and an introduction to their context, 1968–1974, Clarendon Press, Oxford, p. 130, Plate 15, 1978. Return to text. Bromage, Ref. 12, p. 33. Return to text. Haviland, W.A., Human Evolution and Prehistory, Holt, Rinehart and Winston, New York, p. 139, Figure 7.2, 1978. Return to text. Walker, A., Leakey, R.E., Harris, J.M. and Brown, F.H., 2.5-Myr Australopithecus boisei from west of Lake Turkana, Kenya, Nature 322:517–522, 1986. Return to text. Leakey, R. and Lewin, R., Origins Reconsidered, Little, Brown and Co., London, p. 260, 1993. Return to text. Willis, D., The Hominid Gang, Phoenix Books, New York City, p. 241, 1992. Return to text. Walker, A. and Shipman, P., The Wisdom of Bones, Weidenfeld and Nicolson, London, pp. 172–173, 1996. Return to text. Leakey, Ref. 11, p. 131. Return to text. Beasley, G.J., Pre-Flood giantism: a key to the interpretation of fossil hominids and hominoids, TJ 4:5–55, 1990. Return to text. Beasley, G.J., Archaic fossil human remains—an update, TJ 9(2):169–215, 1995. Return to text. Beasley, Ref. 24, p. 43. Return to text. Beasley, Ref. 24, Figures 7, 8 Return to text. A nuchal crest is a transverse body ridge across the posterior margin of the root of the skull for attachment of neck muscles. Return to text. Johanson, D.C. and Edgar, B., From Lucy to Language, Simon and Schuster, New York, pp. 38,177–179. Return to text. Johanson and Edgar, Ref. 29, p. 177. Return to text.